BEIJING - Lifan Industry Group Co became the first non-State-owned automaker to be listed on the A-share market when its shares began trading on the Shanghai Stock Exchange on Nov 25. The Chongqing-based maker of motorcycles and automobiles started preparations for its initial public offering (IPO) three years ago and finally won approval from the China Securities Regulatory Commission in October. Its IPO raised 2.9 billion yuan by issuing 200 million shares at 14.5 yuan per share. According to its prospectus, Lifan originally planned to raise 1.48 billion yuan through the IPO and use more than half of the funds raised - about 850 million yuan - to expand its passenger car facilities. Another 350 million yuan will go to its motorcycle plant, while the rest is set to boost its engine production capacity. Lifan closed at 17.5 yuan on Nov 26, down 2 percent from the closing price on its first day of trade. When it was established in 1992, Lifan had only nine staff members and 20,000 yuan in startup capital. Seventeen years later, it ranked as the fifth-biggest motorcycle maker in the country with about 6 percent of the market and annual production capacity of 1 million motorcycles and 2.5 million motorcycle engines. It was the second-biggest Chinese exporter of motorcycle in 2009 with products selling in more than 160 countries and regions. Giving a priority to exports is one of the keys to Lifan's success, said Yin Mingshan, president of the company. The principle also worked for Lifan's car business, which only started four years ago when its first model, the Lifan 520 sedan, hit the market. In the first half of this year, Lifan exported nearly 7,500 sedans, ranking No 3 among domestic manufacturers. According to Yin, the company can generate more profit from exports than from domestic sales since the price overseas is much higher. Lifan's total car sales are currently only a fraction of its large State-owned peers and other private companies such as Geely and BYD. Last year it sold just 43,200 cars. With the funds raised in its IPO, Lifan plans to increase its yearly capacity to 1.3 million motorcycles, 3.2 million motorcycle engines, 200,000 cars and car engines, as well as 1 million general gasoline engines, according to its prospectus. Lifan is the second domestic automaker to be listed this year. Guangzhou Automobile Group Co went public on the Hong Kong Stock Exchange in August through a backdoor listing using its Denway Motors unit. Leading automaker Shanghai Automotive Industry Corp was listed in Shanghai in 2006, while Dongfeng Motor Corp went public in Hong Kong in 2005. Beijing Automotive Industry Holding Co reorganized its assets and set up a joint stock limited company at the end of September this year, a crucial move for the automaker to achieve a stock listing. 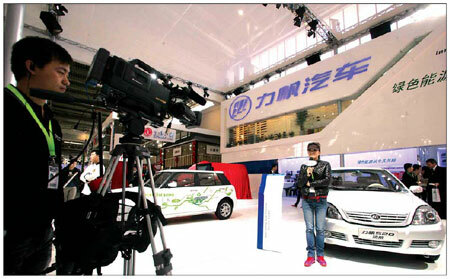 First Auto Works and Chery Automobile Co are also planning to go public. Analysts said Chinese automakers' thirst for capital is fueled by the need to grow stronger amid unprecedented opportunity and intense competition in the world's biggest vehicle market. Last year more than 13 million vehicles were sold in China. The figure is expected to exceed 17 million this year.